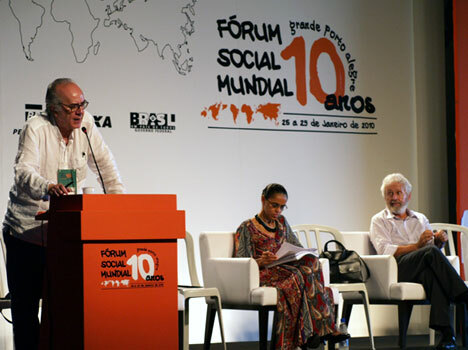 After several days of meetings outlining the various threats posed by the current geopolitical and economic status quo, day four of the World Social Forum was largely dedicated to discussing the necessary solutions. Capitalism and the consumer culture it promotes were again the targets of criticism--and reiterated to be at the center of the looming crises of the 21st century. Climate change, growing disparities between rich and poor, and a laundry-list of social injustices were said to all be 'symptoms' of an unsustainable economic model which needs to be addressed to effect any real change--and a need for radical change in human behavior. In a meeting this morning to address the challenges of a "Sustainable Era," political economist Dowbor Ladislaus discussed the future projected by current trends in resource consumptions. One of his major concerns was with skyrocketing birthrates, articulating a need for population control to quell increasingly unsustainable cultural preferences. "Everyone wants to consume more meat, which means more methane and heat. We have to rethink it," he said. Meanwhile, various speakers met to discuss how a new approach to governance could help ease the trends outlined by Ladislaus, with a new economic model based on sustainability. Getting more people involved and concerned for the environment is the key to moving towards a "post-capitalist horizon," said Portuguese sociologist Boaventura de Souza. Every challenge to the current political hegemony will depend on a broad consensus. It is necessary to focus on democracy; A more advanced democracy, participatory democracy, a democracy Community. Boaventura de Souza addresses an audience at the Forum. It is not enough to defeat capitalism and build a new hegemony. We must also protect humanity from extinction. Perhaps the human species can not survive capitalism. If we want to save the world, people who form the vast majority of the world, should be emancipated and allowed to achieve their minimum aspirations. Later on in the afternoon, former Brazilian Environmental Minister and current Senator Marina Silva continued the themes of reforming the way humanity is governed when she spoke before an audience of roughly 500 in Porto Alegre. The current model of civilization is in crisis. We can no longer patch it. The economic model also shows the phenomenon of exhaustion. And the environmental crisis is exemplified by the current climate change. 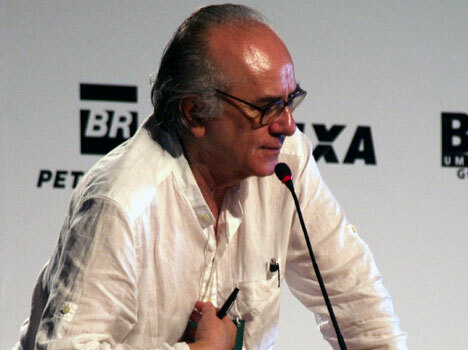 Silva was accompanied by Oded Grajew, who founded the first World Social Forum ten years ago and Boaventura de Souza from an earlier conference. She praised the persistence and determination of those "utopian dreamers" who battle against neolibralism. 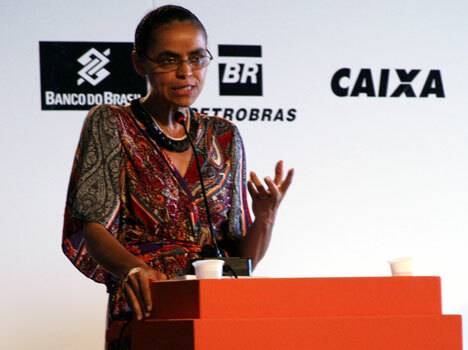 Former Brazilian Environmental Minister, Marina Silva. According to Silva, the vast majority of people in the world are not interested in the economic prosperity that drives the wealthy few, but are rather seeking a sustainable quality of life. Sadly though, she said, that minority is capable of reaping cultural and environmental devastation in its pursuit. She referenced the impact of past imperialism--noting that there were 5 million natives in Brazil in 1500, but five centuries later, there are only 700 thousand. We must change the policy, change the planet and always with an ethical commitment, forging an alliance between the generations. Everything we do now will surely pass on to future generations. We reached the age of limits. We must begin the march towards transformation. Check out coverage of Day 5 at the World Social Forum tomorrow. That’s one small tweet for man, one giant tweet for mankind. The virtual realm has physically expanded once again as Timothy Creamer a.k.a. 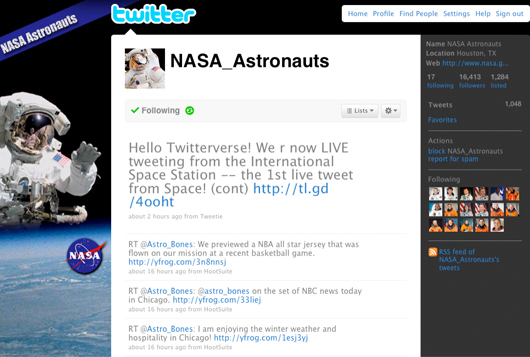 Astro_TJ made Twitter history by being the first person to tweet live from space. To consider in relation with the "Deep Space Network" or rather the "Deep Space Internet". Then, it's still just a tweet, we are waiting for more!